Having definite quality management systems, we are keenly engrossed in presenting Embezzlement and Fraud Investigation Service. Promptly implemented, these provided services are appreciated amongst our clients owing to their reliability and on time execution. Together with this, we provide these services to our treasured patrons as per their given details and requisites. 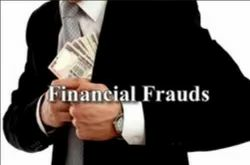 We are providing Fraud Investigation Services. We provide fact finding services, which include determination of the amount and the circumstances of a loss, analyses of evidence and identification of possible perpetrators. In addition to investigation, we also provide Fraud prevention services, which includes risk analysis and designing of fraud prevention strategy for the client’s, enabling them to prevent any future losses due to fraud. We are rendering Fraud Auditing Service. These services are accomplished by expert’s team who has affluent industry proficiency and practice. To rendering this service in effective way, our experts employ the advanced techniques. Besides, we render this service at reasonable costs. You don't know where the money is going. Financial frauds can be defined as an intentional act to deceiving someone in a financial transaction for a purpose of personal gain. Owing to vast industrial experience, we are involved in rendering best quality of Fraud Investigation Service. Our entire cases are undertaken under the expert supervision of experts who understand the market conditions efficiently. Our entire services are flexible in nature. Using our unique software solution, you can match signatures on scanned documents automatically. Our solution attempts to match a candidate signature (cropped from a KYC or other application forms) against a database of reference signatures and arrives at a 'confidence level' - to determine best matches.